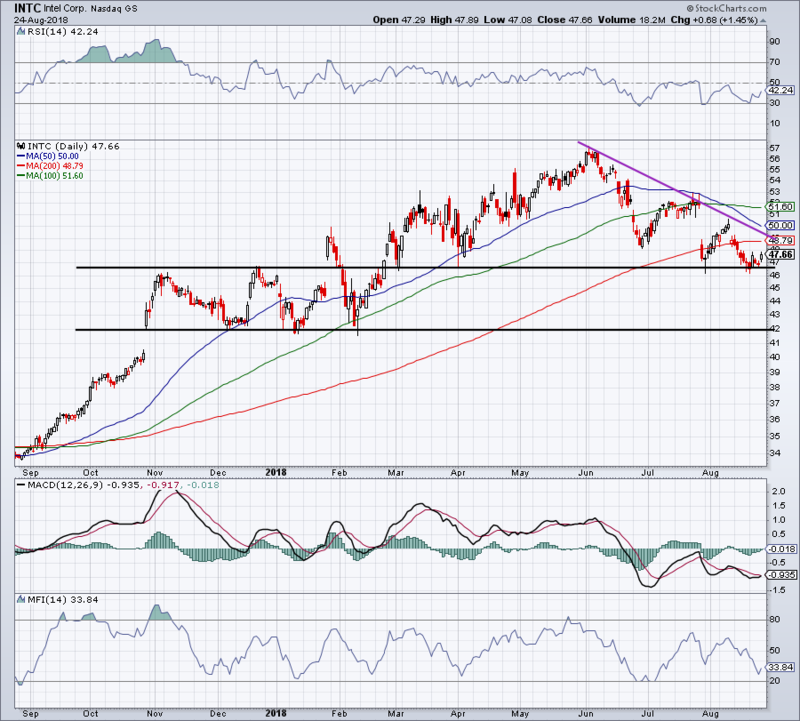 The fear with Intel (NASDAQ:INTC) stock? Growth and execution. The comfort though? Intel stock has a low valuation and a decent dividend yield. Admittedly, that yield was more attractive before the stock’s big rally, but shouldn’t be ignored as it’s over 2.5%. The stock’s recent underperformance has a lot of investors wondering what to do. The simple summary? Intel could have another quarter or two of weakness, but its long-term outlook remains quite positive. That should give long-term investors some comfort and those looking for a new position in the name hope for a better price. Let’s look at the fundamental outlook first, then the technical setup. The demand from chipmakers is only going to increase over time. Technology will improve and become more efficient, but we’ll need Intel chips for years and years to come. However, the company isn’t growing like Nvidia (NASDAQ:NVDA) or Advanced Micro Devices (NASDAQ:AMD), not even close actually. Because of that, Intel stock trades at a relatively low valuation, at just 11.3 times this year’s estimates. While earnings are expected to grow 20% this year, 2019 won’t enjoy the same catalysts. Instead, estimates call for just 3% earnings next year. Similarly, revenue estimates call for 10.8% growth this year and and just 3.3% growth in 2019. However, the long-term outlook is bright as Intel’s biggest segments happen to be industries with plenty of secular growth, that being the data center and cloud. Further, Intel is positioning itself into budding growth markets, like Internet of Things and autonomous driving, among other fields. Interestingly enough though, Intel actually raised both sales and earnings guidance for Q3 and the full year. All four metrics came in ahead of analysts estimates last quarter, while earnings and revenue for Q2 also topped estimates. It’s hard to fully explain the selloff. Particularly at this valuation and with a 2.6% dividend yield. Maybe investors are still leary of the company after CEO Brian Krzanich was forced to resign. Perhaps it’s the slowdown in growth that’s expected in 2019. This guessing game makes it tough for investors. Thankfully though, the charts can paint a better picture. I don’t want to underestimate what Krzanich was for Intel. Despite his personal conduct, he was an excellent leader for the company. The board likely wouldn’t have given him the boot though if they didn’t feel the current team couldn’t lead Intel to the promised land. However, that transition can be bumpy for a quarter or two. While the fundamentals check out for the most part, the charts do not. Shares are down about $10 from the $57 highs or about 17.5%. Intel stock is now clinging to support between $46 and $47. The stock is now below all three major moving averages, while downtrend resistance looms overhead (purple line). Keep it simple with this name. 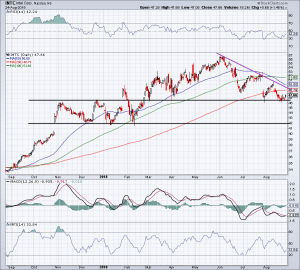 Over $46 is good, but Intel stock isn’t great until it clears downtrend resistance. From a trading standpoint, it’s bearish to see a horizontal level of support tested over and over, while downtrend resistance pressures the stock lower. That’s exactly what we have with Intel right now and you know what they say, the more times a level is tested, the more likely it is to break. So while Intel as a company may not be broken, its stock is getting close to cracking. Long-term investors may not care as they DRIP the dividend, but new investors may want to use caution. I personally would love to scoop up shares of Intel on a decline to $42. Although, it’s completely possible this 10% pullback doesn’t materialize. Bret Kenwell is the manager and author of Future Blue Chips and is on Twitter @BretKenwell. As of this writing, Bret Kenwell was long NVDA. Article printed from InvestorPlace Media, https://investorplace.com/2018/08/worst-over-intc-stock/.